On February 14, 2013, at 6:51 p.m., the 911 Center received a report of a stranded snowmobiler on the Big Sky Snowmobile Trail, which is north of West Yellowstone. The forty-eight year old Bozeman man had snowmobiled with his wife and son to the Cabin Creek Cabin, which is a U.S. Forest Service cabin that the public can rent. He then returned to their vehicle on Highway 191 to get additional equipment. As he was returning to the cabin, he had a tow sled with supplies behind his snowmobile. The snowmobile overheated and quit running. 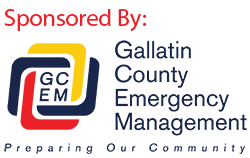 Personnel from the West Yellowstone division of Gallatin County Search and Rescue and the Gallatin County Sheriffs Office responded. Search and Rescue members assisted the snowmobiler with the overheating issue, towed his equipment trailer, and escorted him to the cabin so he could spend the rest of Valentine’s Day with his family.